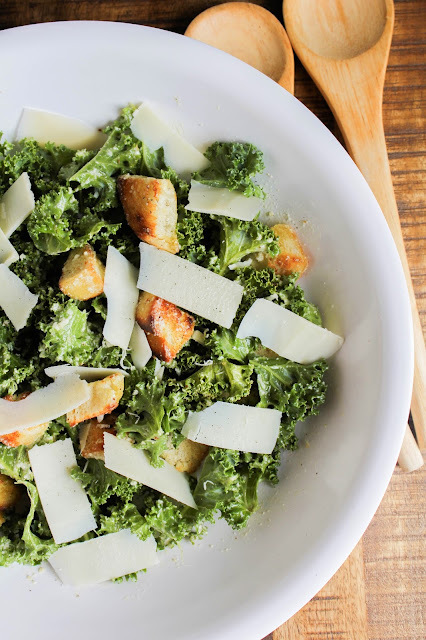 Kick your salad game up a notch with this healthy and delicious Kale Caesar Salad! I love a good salad. Especially in the spring and summer. I'm obsessed with eating salads with tons of fresh, in season veggies. Sometimes I pile on the goodies, even adding chicken or tuna to make it more hearty, and other times I go the simpler route. 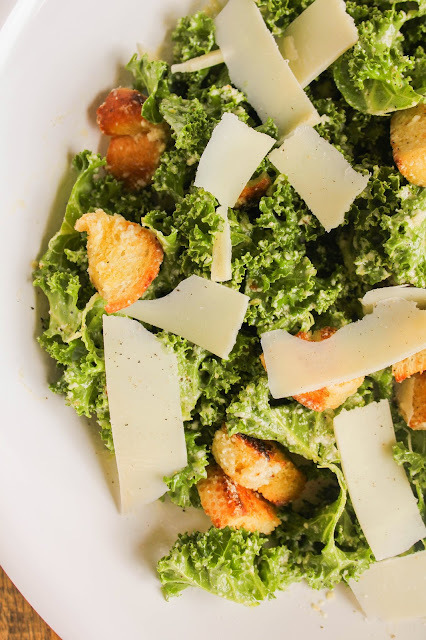 This Kale Caesar Salad is just that. Simple. Fresh kale, homemade croutons, Parmesan cheese, and a homemade dressing. That's it. And really, that's all you need. This has been my go-to lunch for the last week. I just can't get enough! Coat a medium skillet with the two tablespoons of olive oil. Add the garlic clove and the red pepper over medium heat. Cook the garlic for about five minutes, until it becomes golden and aromatic. Remove and discard the garlic clove. Add the bread cubes and cook, stirring frequently, until they are golden brown and crispy. Remove from the heat and set aside. In the bowl of a blender or a food processor, combine all of the dressing ingredients, except the salt and pepper. Puree until the mixture is smooth. Season with a pinch of salt and pepper and taste. Adjust seasonings if needed. In a large bowl, massage the kale with about half of the dressing. Add the croutons and and the rest of the dressing and toss to combine. Top with shaved Parmesan cheese and serve.